This sequel to 2012's "Scenes from a Gay Marriage" picks up two years after the original left off, and it turns out things have gotten a little meta. Leigh, Darren's ex, has made a gay-themed film about how Darren and Joe met and fell in love. 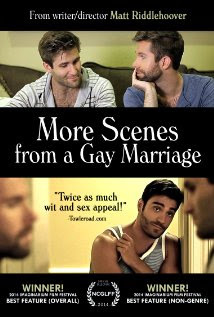 As a result of the film's success, Darren and Joe begin to question whether their domestic partnership is as exciting or romantic as what led up to it.